In the second of the River Cottage Handbook series, Pam Corbin explains how to turn Britain’s seasonal gluts of fruit, vegetables, flowers and herbs into delicious preserves to enjoy all year around. Preserving is a centuries-old way to make the most out of every season, stretching the more bountiful months into the sparser ones – and what’s more, it is fun, rewarding and easy to learn. Explaining the history, science and basic processes of preserving, Pam Corbin guides us through a world of jams, jellies, butters, curds, pickles, chutneys, cordials, liqueurs, vinegars and sauces that can be made from local produce throughout the year. 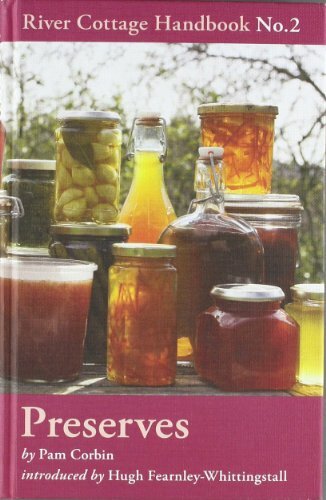 She includes 75 recipes, covering everything from traditional favourites such as raspberry jam, lemon curd, quince cheese and sloe gin, to fresh new combinations such as apple butter, cucumber pickle and nettle pesto.